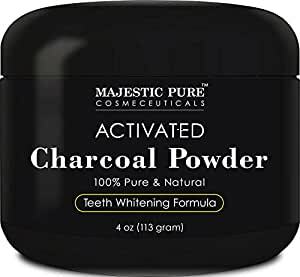 Description: Majestic Pure Activated Charcoal Powder is loaded with natural teeth whitening ingredients such as activated coconut charcoal powder, bentonite clay, and sodium bicarbonate. Note: Charcoal can stain grout and fabrics. Protect counters, floors and clothing before using. SAFETY WARNING: Use only as directed. Keep out of reach of children. If you accidentally swallow more than used for brushing, seek professional assistance or contact a Poison Control Center immediately. Avoid contact with eyes. Discontinue use if irritation occurs.